Young bears are born in January or February in their mother's den. They weigh only 400g or so at birth and are about the size of guinea pigs. They are still little developed at birth. After about three weeks their eyes open; they start to use them for finding their way around in their seventh week of life. Smell, a bear's best sense, as well as hearing begin to work fully at the end of the second month. Young bears are fully dependent on their mother's milk, which is highly nutritious, containing up to 20% fat (human milk is only about 4% fat). When suckling cubs in her den over winter a female bear loses up to 40% of her body weight. The cubs leave the den after about three months. 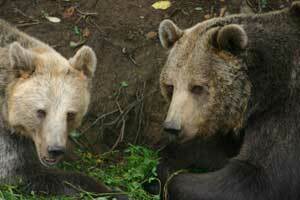 The female stays with them near the den initially so that she can protect them, including from other bears. The male does not help her in raising the young. Their mother gradually teaches them to find food, overcome obstacles, climb trees and hide in case of danger, but she also punishes misbehaviour with a swipe of her paw. Cubs also prepare themselves for life. They are curious and investigate their surroundings, catch insects and play together, wrestle and chase each other. If bears cannot find the remains of animals that died during the winter, while there is still snow up in the mountains they must move lower, where spring is already beginning. They look for any food available. This is mainly freshly-sprouting grass and the first herbs (e.g. white butterbur or coltsfoot). They often pick rosehips or sloe berries still on bushes from the previous autumn. They eat bark, cambium and the buds of young trees. They readily open up ant hills and pick out larvae of ants as well as beetles, which they look for under rocks or in old tree stumps and logs. While looking for food they can also come close to human settlements. With the arrival of warmer weather most bears return to higher localities, where the vegetation is still fresh. The mating season lasts mainly from the end of May until the beginning of August. It is only then that males and females stay together. If several males are interested in the same female there can be battles between males of similar strength, which can end in the serious injury or death of one of them. Signs of rutting are the calling of bears, scratches and bites on trees and well-trodden paths. Female bears have so-called delayed implantation. Eggs begin to develop much later than when they are fertilised. Variation in the duration of this period is the cause of differences in the length of preganancy, which can last 6-8 months. If a female is in poor physical condition, her fertilised eggs die. Female bears usually give birth to 1-3 cubs every second or third year. Young stay with their mother for 2-3 winters. The female only chases them away during the mating season; after this period they return to her. Sometimes older juveniles stay with their mother and her new cubs. During their first year young bears grow to about half the size of their parents, but it is not until they are 10-year olds that they reach their final size. During the summer bears' diets become richer and are mainly composed of forest fruits such as raspberries, bilberries, blackberries and, later, cowberries. They eat berries together with leaves. The autumn is an important period when bears consume large quantities of food in order to build up sufficient reserves of fat for the winter. At this time hard mast such as beech nuts, acorns and pine nuts are added to the menu. Other fruits eaten by bears include those of the rowan, guelder rose and dog rose as well as pears, apples and plums. 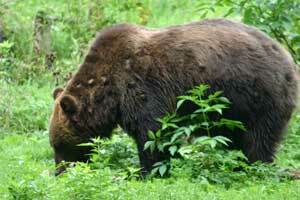 The vegetation component forms up to 90% of bear diet in Slovakia. The animal component is mainly made up of insects. The nests of wasps or bees, where they seek larvae and honey, are irresistible delicacies for bears, being rich in sugar, proteins and other nutrients. 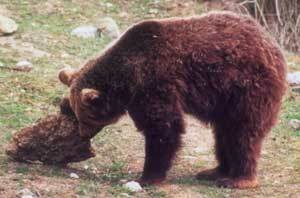 It is only rarely that a bear manages to kill a roe or red deer, generally one that was sick, immature or old. In the past the watercourses of the Tatras were full of trout, which are a favourite bear food. They also eat amphibians, worms and other invertebrates. Bears also love agricultural crops such as maize and cereals, especially oats but also wheat, barley and rye. Sometimes they travel large distances to reach rich sources of food. It can thus happen that several individuals tolerate each s other when gathering at a single location. 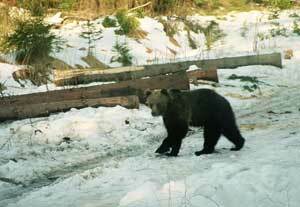 Occasionally bears become the unwelcome guests of sheep or cattle farmers. In winter months bears go into a "winter sleep" called hibernation. Their body temperature falls, heartbeat and bodily functions slow. They consume no food. This "rest" is essential for bears during a time of insufficient food. It is also an advantageous time for giving birth. In chosing dens, bears look for cracks in rocks, up-turned trees and spaces under tree roots or they use inaccessible caves. Sometimes they lie among dwarf pines or dense stands of conifers. On average bears stay in their dens from November until March, depending on food availability, weather temperature and individual. Females with cubs typically stay in their dens the longest. Bears in captivity can live to more than 40 years of age. The maximum in the wild is around 30 years, but most bears do not survive that long. A bear's life is very rich, even if not always easy.